On March 3, 2017, fighters from Saraya Defend Benghazi — also known as Benghazi Defense Brigade, an Islamist militia group that formed in June 2016 to oppose the dominant Libyan National Army and its popular leader Gen. Khalifa Hafter — together with members of Ibrahim Jadhran’s Petroleum Facilities Guard and Misrata’s Al Marsa Brigade, attacked An Nawfaliya, Bin Jawad, Es Sider and Ras Lanuf in Libya’s Oil Crescent. Their goal was to seize the oil terminals in those towns. And thus control Libya’s wealth. The attack has upended the Libyan civil war. The attackers’ convoy of 50 vehicles reportedly moved from Sirte to Jufrah, a distance of 186 miles, two days before the assault. The roads aren’t terrible, so it was possible to make the trip in one night. 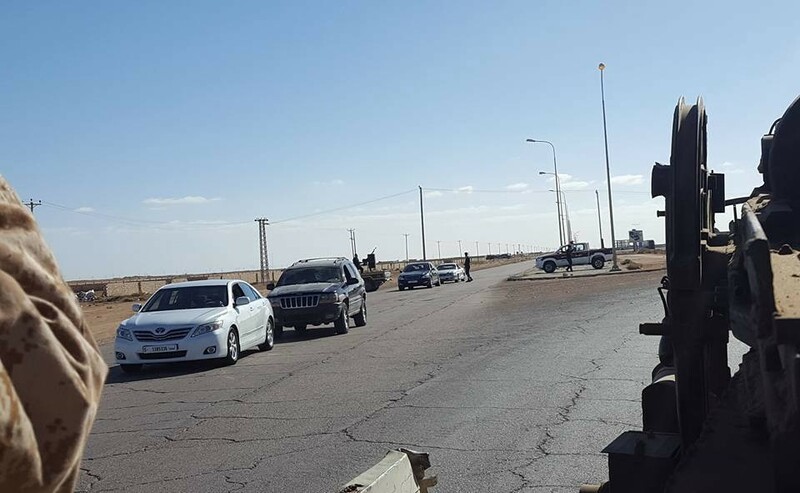 It seems that the convoy went undetected, despite the United Arab Emirates having deployed Wing Loong drones to Libya’s Al Khadim air base in order to support Haftar. As in December 2016, the Libyan National Army Air Force responded harshly, launching air strikes from Ras Lanuf airstrip and Benina air base with Mi-35s and MiG-23s, the latter carrying RBK-250 cluster bombs under their fuselages. The planes and copters struck SDB positions south of Nofaliya and in the Jufrah area. The LNA’s 12th Brigade rushed in as the SDB captured the Es Sidra oil terminal. The attackers assault the Ras Lanuf airstrip, forcing the LNA to abandon one Mi-35 that was out of service due to technical problems. Haftar’s planes subsequently bombed the copter to keep the SDB from using it against the LNA. 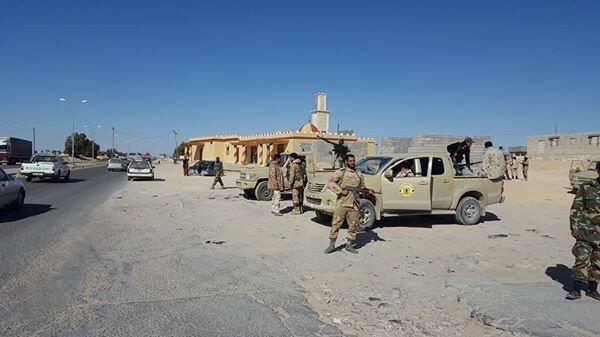 The LNA’s 152nd and 302nd Infantry Brigade claimed to have retaken control of the base the afternoon after it fell, but the LNA Air Force confirmed later that its forces, apparently unable to operate so close to enemy lines, had withdrawn from Ras Lanuf. Haftar has declared a state of emergency in eastern Libya. His MiG-21s, MiG-23s and helicopters carried out 16 sorties shortly after the fighting began. The Presidency Council of the Government of National Accord — the main rival of Haftar’s political allies — denied any involvement in the military escalation. 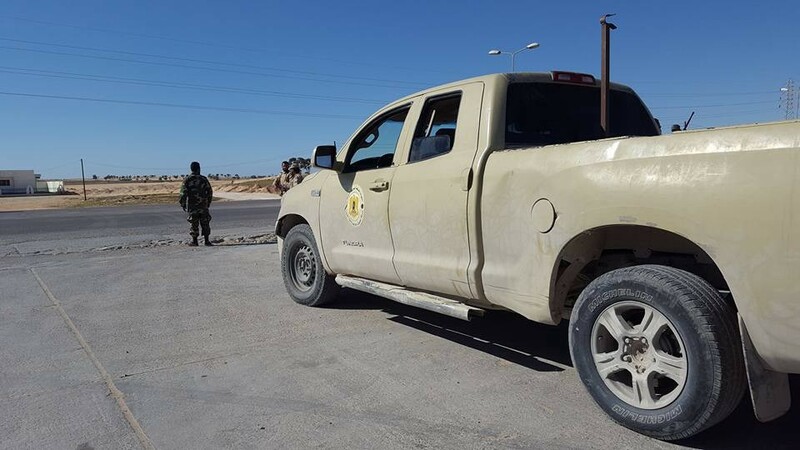 The SDB’s offensive took Haftar, and indeed the world, by surprise — especially considering Haftar’s efforts to reinforce his positions in the Oil Crescent following the SDB’s previous assault in December 2016. The LNA even deployed SA-9 surface-to-missile systems to defend ground troops and bases from the pro-GNA air force. The SDB and its allies saw an opportunity and seized it. The LNA, whose air force is arguably its greatest strength, was at a low point in early March 2017. Many of its warplanes and helicopters were out of service. Since the beginning of 2017, the LNA Air Force had lost one Mi-35 and one MiG-23ML. Despite the work of LNA technicians and engineers to overhaul old, stored jets, Haftar’s air force never numbered more than a handful of MiG-23s and MiG-21s — and many of the MiG-21s are in Tobruk, being flown by pilot trainees. The six Emirati AT-802 attack planes deployed at Al Khadim airbase — and piloted by mercenaries — have helped to bolster Haftar’s air power, but those planes mostly operate over Benghazi. They lack the range and speed to reach the Oil Crescent. The Emiratis are building new ramps at Al Khadim and could eventually deploy F-16s or Mirage 2000s. But the base expansion isn’t yet complete. Russian help was also too late. Following Haftar’s visit to Moscow, the Kremlin sent the LNA at least one old MiG-23. But the ex-Russian plane need maintenance before it can join the air war over central Libya. The day before the SDB’s offensive, GNA prime minister Fayez Al Sarraj himself was in visit in Moscow to meet Russian foreign minister Sergueï Lavrov. The visit followed the collapse of a planned mid-February 2017 summit between Al Sarraj and Haftar in Cairo. If the oil terminals fall into the hands of the SDB and its allies, Haftar could find himself severely weakened — and might be forced to negotiate with Al Sarraj, perhaps via Moscow. If, on the other hand, Haftar is able to retake the territory the LNA just lost, expect the general to heavily reinforce the Oil Crescent … and perhaps launch an offensive on Al Jufrah in order to destroy his enemies in the region.